Another episode down and I’m still feeling this season. I’m here for the fact that, at this point, there are 10 players left in the main game and there’s now only one whose game I really feel like I don’t know (Aurora), and only one other who I think really doesn’t have enough within the show to support the possibility of a win (Gavin). The other eight could still win from here and I feel as though the story would support that, and that’s not at all a bad place to be heading in to the season’s home straight. This week could be a turning point for the season. There’s two boots, and I think the show kind of needs David and Kelley to survive the episode to drive the endgame. However, with no idol nullifier yet in sight, I’m a bit worried for Kelley (or Lauren) — they may finally play their idol just at the wrong time. But isn’t it odd that we are now past the point at which the idol nullifier turned the game last season, without it making an appearance yet? That’s an odd decision by production. Anyway, on to my thoughts for the week! Other than localized Survivor games (like Survivor Maryland), I still believe the closest analogue you can have to playing Survivor is online mafia. Through my years of playing online mafia against some of the world’s best players, I’ve come to see there are a lot of parallels for effective strategy between the two games. For those who aren’t that familiar with mafia, it’s similar to Survivor — you start with a lot of people, and vote out one every so often. The big difference is that you generally play in two factions; one faction is a minority (the mafia) who knows who each other are and get to talk together secretly; the rest are a majority who don’t know who is mafia or not, but whose job it is to vote out the mafia. In that game, as a member of the majority your tactics should be aimed at rooting out subterfuge cooked up between the mafia; while as the mafia, it should be your job to make sure those tactics aren’t discovered. Often, in these games, the gap between votes can be two or three days, just like in the game of Survivor. At all times, players are publicly declaring who they intend to vote for at the end of the period — it’s right there on the screen. When the clock runs out, whoever I’m voting for at that moment gets my vote. It’s very easy to fall into a malaise in mafia ... choosing who you think you’ll vote for towards the start of the period; running out the clock; not really engaging in discussion, reaffirming plans, or making sure the vote is going to go the way you think. And occasionally, when that happens, the last couple of hours get really spicy. There is a tactic often used towards the end of those periods where people will suddenly start voting for people who have no votes, and towards whom there has been no discussion. The idea is just to ‘see what happens’; to shake up the malaise; to put people under the microscope and make them squirm. Sometimes nothing comes of it. But sometimes, when suddenly confronted with the idea of being voted out and only having an hour or two to stop it, things can get suddenly chaotic. A player who previously had no heat will often reveal their cards. They turn to particular people for backup, others come in to back them up without being asked, and the pressure goes on them to answer questions — who are you going to vote for? Why are you going to vote for them? What is your plan? Are there any hidden agendas you have going on? The tactic doesn’t always work, but sometimes it’s truly revealing; whole mafia teams can reveal themselves at once, or at least single players can have their identity laid bare. And for the savvy mafia, it might be a way to get votes off one of them and find ways to make others look bad, allowing them the opportunity to take out someone who isn’t on their team instead of losing one of their own. 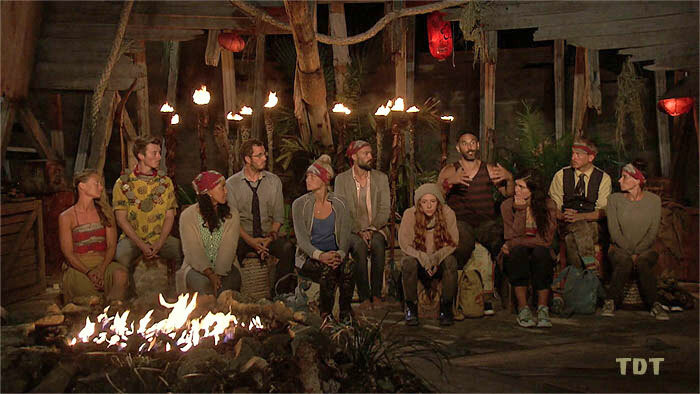 Survivor doesn’t have the ‘mafia’ and the ‘town’ — but it does have majorities and minorities, and it does have people who have hidden plans and agendas. And both were on full display here. Julia played like a classic ‘caught mafia’ here. At the first hint that things might be shaken up, and she might not get her way, she began to melt down. First, she turned on her ally Aurora, worried she might spill the beans; at this point, even though tribal wasn’t live, it was clear that Julia was already cracking under the pressure. Next, she revealed that she had multiple plans — something no one wants to hear (unless they know they’re in on the real and fake plans, which clearly far too many people were not). Third, she resorted to ad hominem attack, saying things like “You’re such a passenger, Rick.” This is one of the biggest signs you have found your mafia; where they can’t defend against your case for why they should be voted out, and they just attack you instead, hoping people won’t listen to the substance of what you’re saying. In a live tribal, an apparent ‘caught mafia’ is exactly the kind of person that is going to get voted out. Everyone is just looking to cling on to the safety they need to get through the next vote. If they can unify around the idea that one person is untrustworthy, by mutual agreement the rest of them make it through and feel like they’re rebuilding trust doing it. However, there was also a ‘savvy mafia’ at play, in the form of Rick and Wardog. These two, knowing that they or their allies were probably most at risk going in, had the most to gain from mixing things up in the last couple of hours. They played their hand to perfection, noting how both Julia and Aurora’s words were concerning their potential allies, and then fanning the flames that they were better targets, less trustworthy targets. The end result was that they did successfully switch the target off their own group, and left Kama taking out yet another of their own. They outflanked their opposition completely and increased all of their own chances of winning significantly in the process. Is a live tribal going to become more and more common? Probably not; and for good reason. When this tactic is used well, it can get great results, as it did with Lesu. But use it poorly, or let it get used against you, and you can undermine your own side’s footing in the game — as happened for Ron and Julie, who probably made little headway by sending Julia home instead of their original target of Kelley. In the world of mafia, the tactic only comes out occasionally — perhaps once a game or thereabouts. 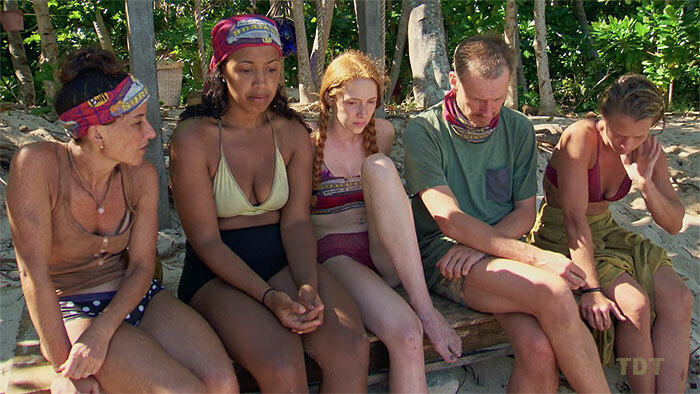 Generally, within the body of the game, you can establish enough evidence to feel secure that your side of the vote will come out on top at tribal council; it’s rare that enough players will be going in who are worried enough about the plan that it will benefit them to cause a little chaos or question whether they are being told the truth. As noted our own Jeff Pitman, in this case it was likely caused by the pressure of only having a single day from the time of the last tribal council to iron out plans; and some of that day was taken up by an immunity challenge. A single day cycle favours the status quo — if you can strongly stick with your most recent voting bloc, and develop a plan together, that plan will probably come to pass. From this perspective, Gavin’s plan to vote out David was probably a sensible one (just not necessarily for the reasons he articulated — more on that later). Instead, the bulk of the Kama tribe wanted to switch things up again and vote for Kelley. This makes sense as Kelley’s block of three seems to be the most threatening alliance remaining. However, it meant trying to switch up trust; trying to regain the trust of Ron and Julie in a single day, while not losing the trust of the Lesu 3. Julia, Aurora and Gavin failed completely on both fronts, leaving everyone alienated. In addition to that, people appeared to waste portions of the day barely speaking, and as a result some people (like Rick) were left completely in the dark, with it being assumed they would vote the way they were told. This created the perfect conditions for several players to want to switch things up. At its core, Survivor will remain a game of stability. Everyone wants to feel secure and like they know the plan going into tribal. As a result, I wouldn’t be worried at the prospect of a live tribal happening overly often. But I wouldn’t be surprised if you get at least one a season. A good tactic, when mafia, is to define how a mafia plays and what their tactics will look like. “A mafia will do x, and if we see that behavior, we should vote it out.” I suppose this is a form of priming, where by convincing others that certain behaviours are less desirable, you can get the outcome you want by avoiding those behaviours. I’ve always been a fan of this tactic on Survivor. Premerge, I’d be looking to define what is undesirable for the tribe based on the qualities of other players who I felt would be unlikely to vote for me in the end. Later in the game, though, you start voting people out because they are a ‘threat to win’ — and you have to be extremely careful about defining what a ‘threat to win’ looks like. It should not look too obviously like you. Gavin went to pains this episode to point out David’s strong challenge record across the first two challenges. Having been next only to Wardog in doing poorly at individual challenges through the first two individual immunities, this may have felt like a safe path to Gavin (in fact, it’s possible he was even throwing the challenges intentionally). However, having pointed the finger at David as a challenge threat, Gavin immediately went on to win the challenge — and then suggested David was a challenge threat again. There’s a huge risk in suggesting someone is an immunity threat while wearing the immunity necklace. It is like pointing out to others ‘I’m a threat,’ and looks hypocritical. It would not be hard for Gavin to immediately create that association in other player’s minds, and for those players to never fully shake it again. 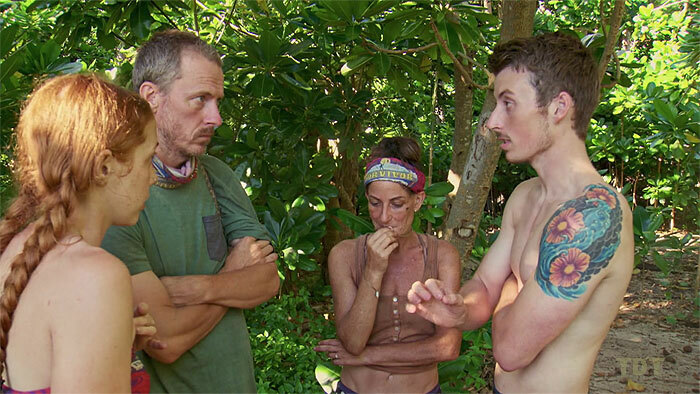 Gavin needed to pick a path — stay away from calling out David as an immunity threat, or not perform so well at the challenge. In the immediate moment of Gavin winning the challenge, it looked like he had made a poor choice. His tribe didn’t seem on board with David going; having David win immunity this time would have made his case even stronger for the next time; and David having immunity might have galvanized the group more and prevented there being a live tribal at all. On the other hand, though, there’s every possibility it would have been Gavin, and not Julia, who went home this week if he wasn’t wearing the necklace. The fact that he wasn’t an option on the table when no one else was safe turned out to be fortuitous. No mafia link on this point, but I couldn’t help noticing how players were seated at this tribal council. Julia and Gavin were off to stage left. Julia’s alliance were off to stage right. The Lesu tribe were in the middle. 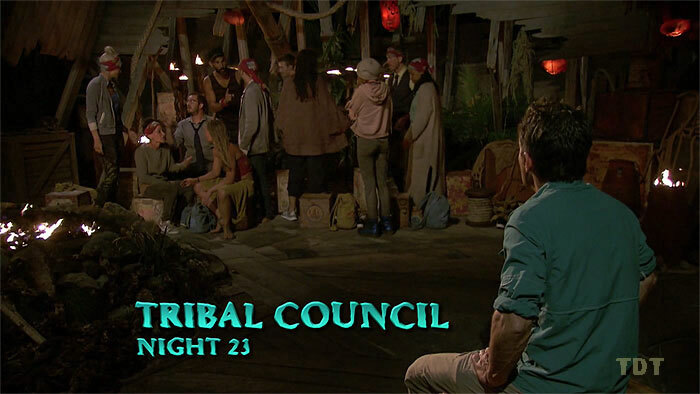 Producers were practically willing Kama to split down the middle, forcing them to get up and talk to each other if they wanted to solidify their plan at tribal council. There’s no doubt that by putting Lesu in the middle, they were given a huge advantage in splitting up the two Kama groups and keeping them isolated from each other. Julia, Aurora and Gavin made a huge mistake by staying seated as long as they did — they needed to do damage control with Julie and Ron as soon as possible. Even more interesting, though, was the placement of Victoria. We didn’t get to see a lot of what she was saying in confessional or to the other players in the game during that day, but whatever it was, it was enough for producers to have her seated as a ‘free agent,’ away from Julia’s trio. 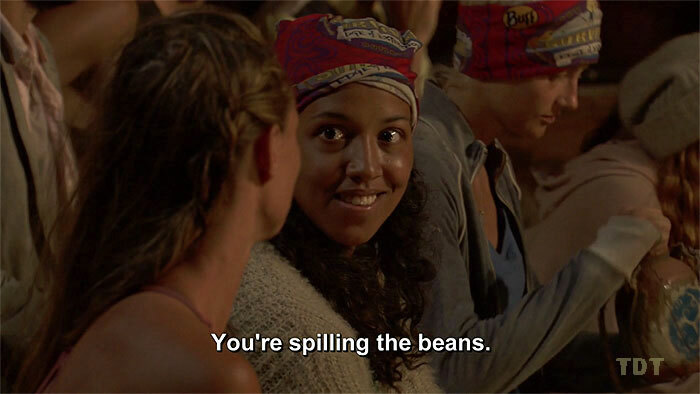 For anyone paying attention at tribal, surely they couldn’t help but notice Victoria’s placement and see it as intentional. The only conclusion I’d have been able to draw (in the moment) would have been that Victoria must not be too close to Julia and Gavin and must be somebody I would at least have a chance of working with. If I’m any member of Lesu, that immediately reduces the number of viable targets by one; there’s no chance I’d be targeting Victoria at all. It’s just another small sign that Victoria, somewhere behind the scenes, is playing a savvy game. She has managed to avoid getting caught by the ill will that was heaped on Julia and Aurora, and it’s likely to help her continue in the game for a little while yet. Alright, another week in the books. Please remember to comment and tweet away at me, and I’ll see you next week!